These two men are Christian leaders in Hamilton, helping people connect with God (Andrew on the left, Andy on the Right). 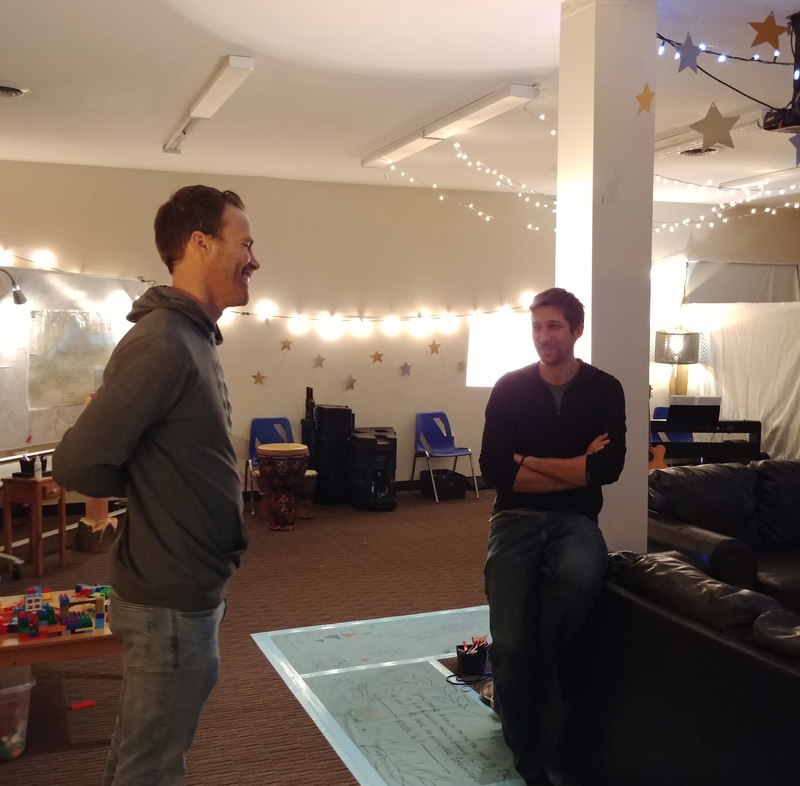 Both are doing simple, but fun things to bring believers together, train them in spiritual disciplines, create spaces for worship, and build up the church in Hamilton. And both men are just getting started, although they’ve been working for a while now. These guys excel at finding people who share their heart, bringing them into the family, giving them space to express themselves, and equipping them to take their vision forward – delegation with direction. I took this picture after a 30 hour worship event, called a “Burn”. We held the event in a pop-up prayer room that was in the middle of 2 weeks of 24/7 prayer. Andrew organized the Burn. Andy’s team organized the prayer room. Andrew and his wife, Kristin, are directors of Burn 24/7 Hamilton. I’m part of their leadership team. We organize worship events in Hamilton. We want to see people come alive in the presence of the Lord, specifically through worship. Burn worship nights happen each month, and longer Burn worship events, usually 24 – 48 hours long, happen every few months. Andy is Co-Director of the Greater Ontario House of Prayer. GOHOP, as it’s known, is very inclusive and missional. When the founding Director, Jill Weber, was first laying the foundations for GOHOP, the Lord spoke to her and her leadership team about GOHOP being a prayer room for Presbyterians and Pentecostals alike. It’s become just that. They teach anything from ancient Catholic meditation to modern worship and prayer models. Now, Jill is moving on and Andy is taking her place. After sitting for coffee or beer with Andy, you can’t escape his contagious passion for prayer. Although Andy has a degree from McMaster’s School of Divinity, his understanding lifts up the people around him, rather than hang over people as a trophy of his intellect. Standing there with these two men, it was a moment I didn’t want to forget. It was after 1 am. Andy was just starting a night shift in the prayer room. Andrew and I just finished cleaning up after 30 hours of worship with believers from all over Hamilton. We were burnt, but energized. Excitement ran like an undertow. There wasn’t much energy on the surface, but our spirits were fully alive. Despite being tired, we didn’t want to leave. There was so much to reflect on. So we stood there voicing wonder and awe at what we’d just been through. But then these guys start talking about vision for what’s coming and where the Holy Spirit is leading them. That’s when I realized how lucky I was. They’re doing amazing things in Hamilton, advancing the wonders of the Kingdom of Heaven. Knowing how Andrew and Andy have impacted Hamilton already, it’s easy to imagine the spiritual future of this city weaving through their service and influence. To stand with them both and be a part of their communities is an honour. There are so many others in Hamilton who are shaping the spiritual landscape. But these men are my friends. I will always have their backs because they have always had my back. It’s exciting to think about where we’re heading together. I wouldn’t miss it for the world.